The term nitrogen cycle refers to the process through which nitrogen transforms into its various states or forms. The process can be biological or physical and has four parts: fixation, ammonification, nitrification and denitrification. Because so much of the Earth's atmosphere consists of nitrogen (greater than ¾), it is extremely important for scientists to understand this process in order to determine and comprehend its effects on various ecosystems. A plant takes nitrogen from the soil by absorbing it through its roots. The nitrogen comes in the form of nitrogen ions. When the nitrogen is absorbed by the plant, it is reduced to nitrite ions. Next, it becomes ammonium ions which can be incorporated into amino or nucleic acids and into chlorophyll. When a plant dies or an animal dies or when a plant or an animal expels waste, organic nitrogen is then released. Bacteria is able to convert this organic nitrogen into ammonium. It does this through a process called mineralization. Nitrogen gets into the oceans as a result of runoff from ground water or when it rains. Nitrogen can also get into the ocean through precipitation (rain). Nitrogen in the water undergoes fixation, which is generally facilitated by a bacteria called cyanobacteria. After fixation, the nitrogen is in a biologically available form that phytoplankton in the ocean can use. The plankton excrete both urea and ammonia into the water. Phytoplankton and waste products can sink downward, introducing ammonia at a depth below the euophotic zone. The ammonia from the waste products is then removed from the euphotic zone and bacteria that live below the euphotic zone can convert the ammonia into nitrate. This conversion can only occur below the euphotic zone where there is no light since the bacteria that perform the conversion are inhibited by light. The process of conversion is called ammonification or mineralization. Once the ammonia is converted, nitrification occurs and the ammonia becomes nitrite and nitrate. Vertical mixing and upwelling can carry the nitrate upward and it can then be used by photoplankton to continue the cycle. The nitrogen cycle is affected by factors that work to facilitate the conversion of nitrogen into various states and back through the atmosphere. The use of agricultural fertilizer. The growing of legumes by agriculturalists. Legumes are able to convert nitrogen to nitrates and nitrites. The use of nitrates by bacteria in soil. Microbes in soil and water that change ammonia into nitrites. Bacteria called Nitrosomonas that convert ammonia to nitrites. Bacteria called Nitrobacter change nitrites to nitrates. Termites and shipworms pair with bacteria to change nitrogen's form. Cyanobacteria that live in semi-aquatic environments can participate in the nitrogen cycle. Industrial fixation can be used to convert nitrogen to ammonia at temperatures of 600 degrees and beyond with the use of catalysts. Nitrogen can be fixed atmospherically via lightning. Now you have lots of different examples of how the nitrogen cycle works and of some of the things that can impact the nitrogen cycle. These examples should help you better understand this important and life-sustaining process. "Nitrogen Cycle Examples." YourDictionary, n.d. Web. 18 April 2019. 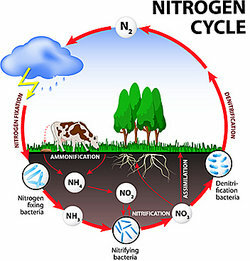 <https://examples.yourdictionary.com/nitrogen-cycle-examples.html>.